The Mayor of London, Sadiq Khan, has setup a new taskforce that he hopes will encourage boroughs, Government and all involved to work together to install rapid charging points – indirectly tackling air pollution in the city. The private sector’s involvement in the installation of new rapid charge points is being seen as “vital”, from petrol stations to businesses and car parks, and the participation of boroughs, that manage 95% of London’s roads. Encouraging Londoners to switch from diesel to electric vehicles is also being seen as crucial to both improving air quality and realising the Mayor’s ambitions for London to become a zero-emission city. The taskforce comprises 16 organisations including UK Power Networks, Ofgem, Shell UK, SSE Enterprise, the British Retail Consortium and the RAC Foundation. The work of the taskforce will be outlined, including technical workshops run by Transport for London (TfL) over the summer, in a shared Delivery Plan is to be published next year. Responding to the Mayor’s announcement that he will be setting up an electric vehicles taskforce, Caroline Russell AM, chair of the London Assembly Environment Committee, said: “The Environment Committee recently published its report into electric vehicles and we strongly called for a pan-London approach to electric vehicle charging points. It’s good to see the Mayor is moving towards this with a dedicated taskforce. London currently benefits from 104 rapid charging points, more than half of which are for taxis, alongside around 2,000 standard charge points. At least 150 TfL-funded rapid charge points are set to be in place by the end of 2018, in addition to new infrastructure in residential neighbourhoods. However, this rapid network has mostly been delivered on land or roads managed by TfL – which is considered a limited resource. The Mayor would also like to see rapid charging ‘hubs’ – a group of charging points, similar to petrol stations – set up across the city. 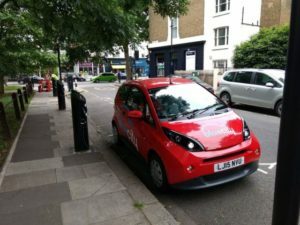 Electric vehicle adoption in London has been higher than that witnessed across the rest of the UK, with an estimated 10% of the UK total of electric vehicles being in the capital city, the Mayor’s office said.